Our well-reckoned entity is meticulously engaged in supplying and exporting Geffy Tablets in Maharashtra, India. 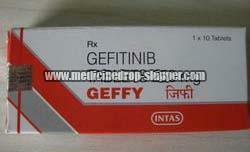 Geffy Tablets help in curing cancer. The offered medicines are used to treat cancer and non-small cell lung cancer. Moreover, these tablets are highly demanded by the clients and can be availed by them at the industry-leading prices. These tablets should be taken under the prescription of a doctor. We offer them at a nominal price.